Last night's Saints-Packers contest marked the start of the 2011-12 NFL season, a season that was still very much in doubt just over six weeks ago. 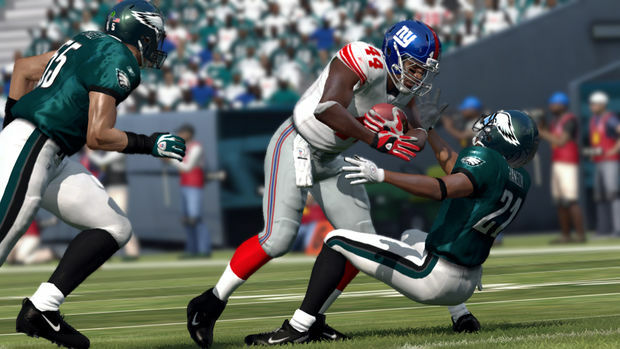 EA Sports had maintained all along that a new Madden NFL game would launch this year, regardless of the status of real-life football, although the publisher pushed back the traditional release date by three weeks. 'Another year, another Madden game,' EA guaranteed us. That sums it up quite nicely, now that I think about it. 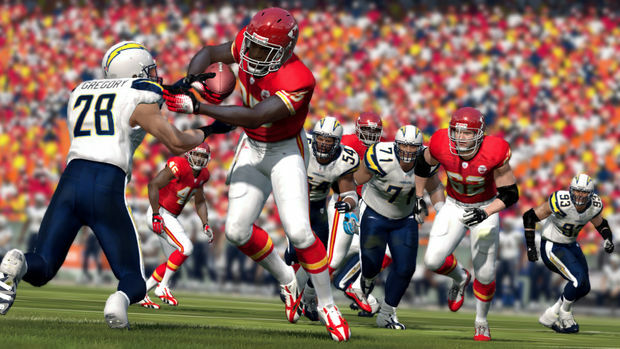 Madden 12 feels like a stepping-stone game, if you will. It lays a solid foundation to build upon, with overhauls in vital, previously stagnant areas such as the Franchise and Superstar modes as well as in-game physics and visual presentation. Generally, the facets that Tiburon has focused on this time around boast noticeable upgrades, and as usual, most aspects of the title have seen some changes. But the studio hasn't touched some fundamental, glaring issues for years, and that's a major disappointment. One erstwhile complaint that Tiburon did address is the age-old "suction"/"warping" problem, in which players would often skate along multiple feet of in-game field into canned animations. The physics engine they've implemented isn't exactly Backbreaker-like (or even "Backbreaker lite"), but it mostly does away with warping by not initiating animations until players actually make contact. You'll still sometimes see players who are locked in an animation slide across the grass, among other physics weirdness. This is a great first step, though, and it provides palpable improvements in tackling. GameFlow, the automatic play-calling system that debuted last year, is now actually a viable option on both sides of the ball (in Madden 11, using it on defense yielded poor results). The interface now includes user input: defense offers "gameplan," "conservative," and "aggressive" choices, while you can select a run, pass, or play action on offense, and the game will give you the name of the play you're about to run. The schemes don't always correspond to the selections -- the last time I checked, blitzing the free safety wasn't exactly conservative -- but it's a much better system than pressing X/A for a random play, which is what GameFlow often felt like last year. 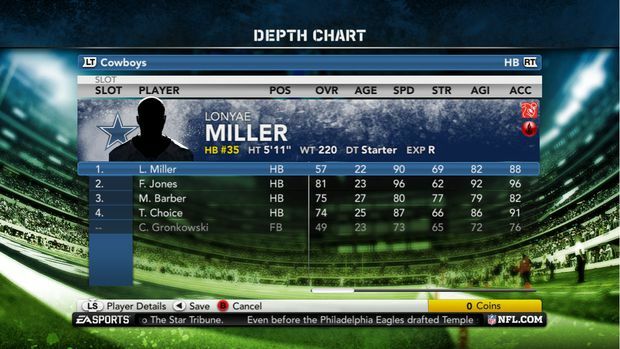 It'd be nice to see information about a play's formation and personnel, too; here's hoping that comes in Madden 13. If GameFlow suggests play action, you might not want to listen, since it's still rarely successful even if you've already run roughshod over your opponent. Too many of the play-action passes I tried forced me to hurry a throw or take a sack -- apparently, they don't sucker any defenders into believing the run. Blockers are similarly incompetent on rushing plays; I've seen countless linemen and tight ends stand around twiddling their thumbs, completely ignoring a defender who lined up right across the line of scrimmage and is now blowing by them to take down the ball carrier in the backfield. And don't even get me started on kickoff and punt returns, where the blocking is nonexistent -- I've considered just calling for a fair catch every damn time. Blocking continues to befuddle the Tiburon folks, apparently. Poor blocking makes offensive success tougher, and this year's defensive improvements further shift the balance. Tiburon has worked to make zone defense worthwhile, and it shows. I'd grown tired of seeing blown coverages in previous Madden games, but just like you could finally run draw plays and sweeps for positive yardage last year, you can finally call zones in Madden 12 and see them succeed. The audio, on the other hand, can be horrendous. Tiburon wowed fans by bringing in the enthusiastic Gus Johnson last year, but his wide range of excitement levels is poorly suited to videogame commentary, which entails jamming together parts of pre-recorded lines. On a deep ball, you might hear something like this: "GOING UP TOP ... the pass falls incomplete." Worse still, the repetition from both Johnson and analyst Cris Collinsworth seems particularly egregious this year -- Johnson always points out a guy who is "definitely primed to be a performer to watch in this one," often multiple times in a game -- and the commentary tends to lag a few seconds behind the action. I've also heard lines that flat-out don't apply to the situation or players on the field. In a Cardinals game, Johnson proclaimed that "Fitzgerald made solid contact and popped the ball out of there" -- but of course, Larry Fitzgerald is a pass catcher, not a pass defender, and he wasn't even on the field at the time. In another game, I caught Johnson talking about a "big gain" after a five-yard reception. These kinds of gaffes are inexcusable, and unbecoming of EA's marquee sports series. The commentary gives a poor showing in the all-new TV-style presentation, too. 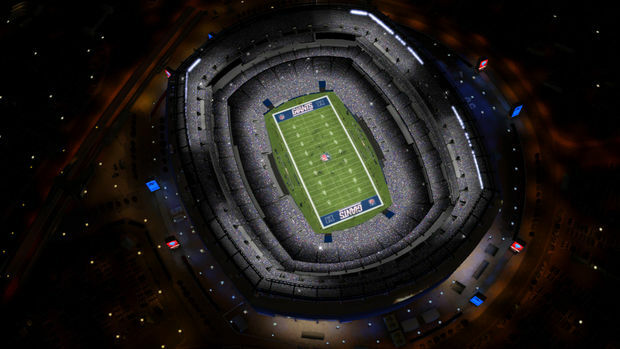 How many football games have you watched where the announcers didn't say a word until the coin toss -- until after the establishing overhead shot from the blimp and the smoke-heavy home-team introduction? The new presentation elements look fantastic -- Madden has never resembled a football telecast as well as it does here, with TV-specific camera angles, familiar shots, and relevant statistical overlays -- but the audio side just doesn't hold up its end of the bargain. 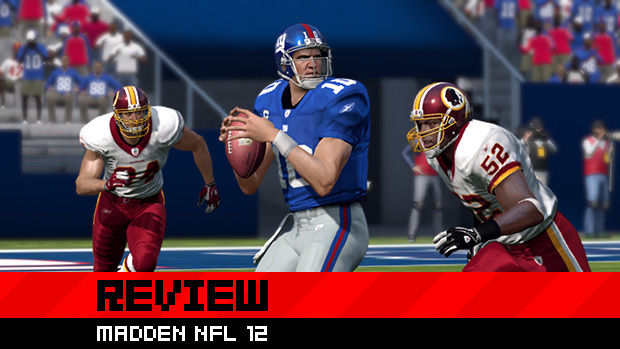 Madden 12 might not offer a terrific gameplay or audio experience, but Tiburon has finally made an effort to revamp its main game modes, Franchise and Superstar, both of which had long remained essentially unchanged. Franchise highlights include vastly improved pre- and off-season components such as scouting, drafting, and roster management. The new free-agent signing setup, with its countdowns and bidding wars, is a brilliant representation of the frenzied off-season scramble for top-tier talent, although the game throws you into the thick of it without so much as a text tutorial. Expanded rosters allow you to start the preseason with as many as 75 players, which you then have to whittle down during cut days. And players who go down for the season can finally be placed on injured reserve, which opens up a spot for you to bring in a replacement. Roster nerds will be in heaven here. A few areas are lacking in complexity. The actual act of signing/re-signing players isn't much of a negotiation at all -- lowering a player's salary or signing bonus, even just a little, doesn't yield anything but "offer rejected," and there’s no indication of his willingness to accept a deal based on the terms you're offering. (Curiously, this "desire" indicator does exist elsewhere: only when hiring coaches.) You can also spend money on stadium upgrades such as a heated field, but why bother? The game doesn't tell you what effect, if any, such expenditures have on attendance, revenue, or team performance. Am I nitpicking? Perhaps, especially since this is the first time in years that I've actually wanted to keep playing Franchise past the period required to review the game. Superstar mode offers a new player progression system, but that's about all there is to it -- earning skill points to raise your attributes. Unlike RPG-esque modes in other sports games, there's no sense of working your way up: you become the starter immediately, regardless of the other players on the team at your position. 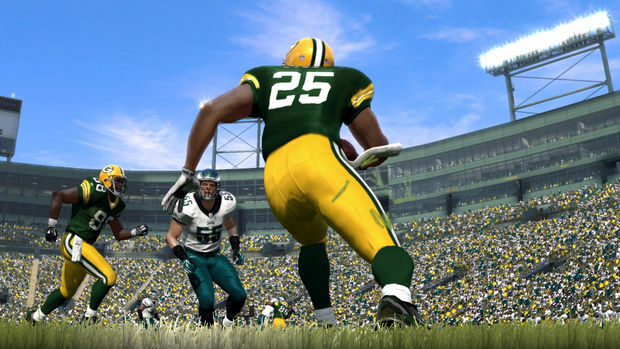 You could create a 69-rated QB and join the Green Bay Packers, and you'd start ahead of the 98-rated Super Bowl MVP Aaron Rodgers, whereas Rodgers himself had to watch and learn from Brett Favre for years before he was given the starting job. And while you earn skill points for performing well, the actual breakdown of those points is a mystery -- as a running back, I've earned points for touchdowns in games where I didn't score any, and I've been docked points for being sacked. In addition, you don't seem to get points for doing the little things, like picking up a blitz. But perhaps my principal annoyance with Superstar is the fact that you can't turn off the coordinator audio; I stopped playing the mode because I just couldn't listen to him explain a draw play one more goddamn time. Another annoying thing Madden 12 forces you to sit through is trailers in its online hub, which would make sense if players hadn't already bought the game. The online experience itself is top-notch; Tiburon has fixed issues from years past such as laggy kick meters, and the head-to-head matchmaking almost always pitted me against opponents of a similar skill level, so the games were close. I did have problems connecting to the EA servers at times, with the game citing a high volume of traffic, but once I was online, the games were a lot of fun. 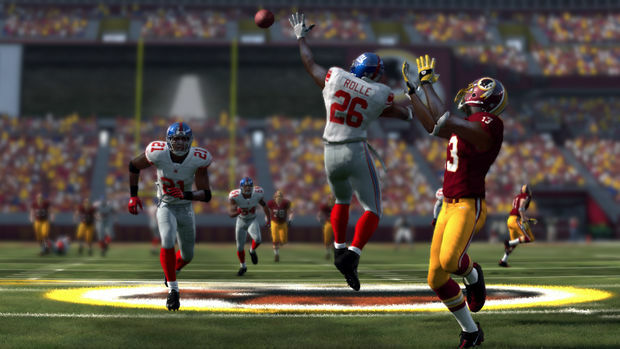 Indeed, Madden NFL 12 is a typical entry in EA's 23-year-old football franchise: Tiburon has lavished attention upon certain facets of the game but has neglected other areas, some of which suffer from long-standing problems. There's a lot to like here, and I think the game could be great in a year or two, but the quality level simply varies too much. If you're a Franchise nut who's been aching for a broadcast look and better visuals, you're in luck this year. Those seeking a significantly improved on-the-field experience, well, hey... be thankful that you can watch the NFL on Sundays.